Saboteurs have once again blown up the pipeline that delivers natural gas to Israel and Jordan for a tenth time. Saboteurs have once again blown up the pipeline that delivers natural gas to Israel and Jordan. The latest attempt, which occurred early Sunday, may not have been as successful as the previous attack. Egyptian officials said it did not appear that any of the precious resource was leaking from the pipeline, although tests have not yet been completed, so it is possibly that the flow of supplies may not be interrupted, or if they are, it won't be for long. Technicians are continuing to check the equipment to see how much damage, if any, the explosion caused, as Egyptian troops began searching for the culprits. 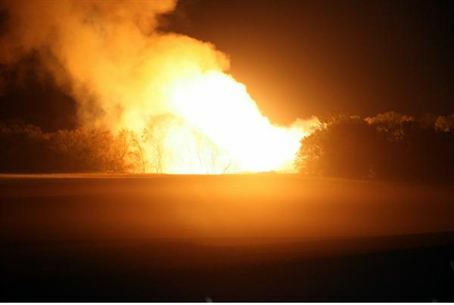 The previous attack on the pipeline took place only three weeks ago. It was the tenth such incident since January to strike the supply line, which runs west of El-Arish in Sinai. The Egyptian government promised late last month to tighten security measures in the area by installing alarm devices and recruiting security patrols from among local Bedouin tribesmen. Officials said a decision on whether or not to close down the pipeline would be made within the next several hours. No suspects have as yet been arrested.